For a subscription, click here to access the online booking site (in French). Open only during major events. Visitor : $4 per 20 minutes, maximum 20$ for 24hrs ($20 payable at the entrance during Olympic Stadium or Saputo Stadium events). Monthly: $ 120. Click here to access our online reservation site. Holiday Package: $40 for 8 consecutive days. One entry and one exit allowed for the 8 day period. Click here to access our online reservation site. Instructions: take a ticket from the machine at the entrance and pay at the ticket booth when you are ready to leave. Automated booths are located in the stadium lobby (Rotonda) and on both levels of P5. Sports centre (monthly): 25$ per month with a 4 hour limit per day. Click here to access our online reservation site. Park-and-ride: $60 $ per month. Rate offered to OPUS card holders. Valid in P1 to P4, from Monday to Friday from 5:00 a.m. to 10:00 p.m. Direct access to Pie Ix metro. Click here to access our online reservation site. Obtain your ticket when you enter the parking lot. When you are ready to leave, you can pay for your parking at the pay station near the entrance doors (VISA, MasterCard, debit, or cash) or at the pay station located at the exit barrier (VISA, MasterCard, or debit). Present your ticket to the scanning reader. The amount to be paid will appear on screen: $4 per 20 minutes, up to a maximum of $20 for a 24-hour period. Pay the amount owed using credit, debit, or cash. Present your ticket to the scanning reader (bar code facing upwards). Pay the amount owed using credit or debit. What happens if I leave with my vehicle after 24 hours have elapsed? In this event, the rate of $4/20 minutes applies on top of the 24-hour fee, up to a maximum of $20 for an additional 24-hour period. The attraction I came to visit is closed. Do I still have to pay for my parking? There is a 20-minute delay starting from the moment you enter the parking area. If you exit within this delay, you will not have to pay for parking. However, these minutes do count towards your total parking fee. For example, if you park for 25 minutes, your total will be $8, but if you only park for 15 minutes, you will not have to pay for parking. How can I take advantage of the preferential rate offered to clients of Cinéma Starcité? Only clients who purchase movie tickets at Cinéma Starcité can take advantage of preferential cinema parking rates. Collect your ticket from the the pay station near the entrance by pushing the button. Be sure to keep this ticket on you, as you will need to validate it at the cinema. The pay station in the cinema is located in the hallway leading to the movie theatres. Only clients who have paid for a movie ticket can access it. Present your ticket to the scanning reader, which will validate your ticket and deduct $5 from your total. Once validated, your ticket can be paid for at any pay station in the cinema. IMPORTANT: If you do not have your ticket validated, you will not receive your $5 discount. This means you will have to pay the full $20 when exiting the parking lot. No discount can be provided at this point. Please remember to VALIDATE YOUR TICKET at the cinema. NOTE: Validating your ticket gives you a $5 discount for a maximum of 24 hours. If you park for longer than 24 hours, you will be billed at a rate of $4/20 minutes up to a maximum of $20 per additional 24-hour period. A ticket can only be validated once. How can I take advantage of the preferential rate offered to clients of the Sports Centre? Only clients who use the installations at the Sports Centre (open swim, Wibit Sundays, training, classes, and gym members) can take advantage of preferential Olympic Stadium Sports Centre parking rates. Collect your ticket from the the pay station near the entrance by pushing the button. Be sure to keep this ticket on you, as you will need to validate it at the Sports Centre. The scanning reader in the Sports Centre is located next to the column at the bottom of the stairs, near the locker rooms. This will set your fee to $5 for 4 hours of parking. Only clients who have paid to enter the Sports Centre can access it. Once validated, your ticket can be paid for at the pay station at the parking entrance of the exit gate. IMPORTANT: If you do not have your ticket validated, you will not be able to take advantage of the $5 fee. This means you will have to pay the full $20 when exiting the parking lot. No discount can be provided at this point. Please remember to VALIDATE YOUR TICKET at the Sports Centre. NOTE: Validating your ticket sets your parking fee to $5 for a maximum of 4 hours. If you park for longer than 4 hours, this period will be added to your $5 fee and you will be billed at a rate of $4/20 minutes up to a maximum of $20 per additional 24-hour period. A ticket can only be validated once. I received a QR code in my confirmation email following my transaction. How do I use it? This QR code will enable you to enter and exit the parking lot for the 3 first days after applying for your parking permit. Within these 3 days, you will need to visit the Parking Service counter to pick up your parking access card, at a cost of $15. Once your card has been linked to your permit, the QR code will no longer work. At the pay station, display the QR code on your smartphone and place it screen-side up under the scanning reader. Note that the scanner will not be able to read the QR code if it has been too enlarged. Why did my email not contain a QR code? Your OPUS card, which can be used to access the parking lot. Your current access card, which will contain your new permit. Simply continue to use your access card as usual. Where can I find the Parking Service counter? This counter is located at 4545 Pierre-De Coubertin avenue. Simply follow the directions for “Billetterie et stationnement” once in the Rotunda. How do I access the pay station with my access card? The red light on the pay station is a scanning reader. Simply place your access card flat under the light and wait a few seconds for the barrier to open. If you remove your card too quickly, the scanner may not have time to read it. Wait until a message appears on screen telling you to remove your card. Do not cover the magnetic strip with your hand when placing your access card under the scanner, as it may not be able to read your card. How can I renew my permit? Visit your online account, select “Renouveler mon abonnement,” then hit the “Renouveler” button next to the permit you wish to purchase. Then follow the payment steps. The pay station at the entrance will let you know that your permit is about to expire a few days before it runs out. Simply bring your access card to one of the pay stations near the parking entrance to renew your permit. If you don’t renew your permit the day it expires, the pay station at the exit will ask you to pay for your permit before exiting. Simply use your credit or debit card to pay. If you do not wish to renew your permit at this time, press the “Cancel” button and the barrier will open (unless your permit has already expired). My permit has not expired, but the pay station will not lift the barrier without payment. What do I do? The pay station at the entrance will let you know that your permit is about to expire a few days before it runs out. If you do not wish to renew your permit or do not wish to renew it on the spot, simply press the “Cancel” button and the barrier will open. Note that you will not lose any days on your previous permit by purchasing a new one in advance. The start date of the new permit remains the day after your old one expires. For example: You renew your permit on February 7 but your old permit only expires February 10. Your new permit will nonetheless cover the period from February 11 to March 10. I renewed my permit online, but the pay station is still asking me to renew it. What do I do? You have probably renewed your permit on a new card, as opposed to your current one. To remedy this, when your permit expires, you can simply use the QR code sent to you by email to use the parking lot for 3 days. During this time, you must visit the Parking Service counter during operating hours to have your new permit linked to your current access card. I forgot my access card at home? What do I do? You must pick up a ticket when you enter the parking lot and pay it when you exit. I’ve lost my access card. What can I do? You can purchase a new access card for $15 at the Parking Service counter during operating hours. When you receive your new OPUS card, call or visit us at the Parking Service counter during operating hours to update your file. I made an error when selecting the dates for my permit. Can I change these? Clients must select their dates for validating a permit. These will appear on screen to be validated before finalizing the payment, and cannot be modified thereafter. Please be sure to verify all information before making your payment. My email did not contain a QR code. How come? 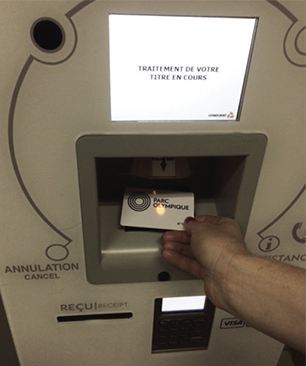 If your permit is linked to your OPUS public transport card, you will not receive a QR code, as your OPUS card serves as your access to the parking lot. What happens if I go over the time period I'm allowed to access the parking lot with my OPUS card (5 a.m. to 10 p.m.)? You can enter and exit the parking lot at any time with your OPUS card. However, any time you are parked outside the hours allotted by your access permit, you will be charged $4/20 minutes to a maximum of $20/day. This amount is cumulative if you leave your car in the lot over many days. I don’t want to pay $15 for an access card. Can I use my OPUS card to access the parking lot instead? Simply visit the Parking Service counter during operating hours and present your OPUS card to the attendant, who will link it to your parking permit. Be sure to bring your employee ID with you to take advantage of the preferential rate. If you wish to take advantage of your preferential parking rate, you must visit the Parking Service counter with your ID during operating hours to purchase your discount coupon. Why am I being asked to enter my OPUS card number when purchasing my permit? To complete your transaction, you need to have on hand the card that will allow you access to the parking lot—whether that’s your OPUS transit card or the Olympic Park card that you’ve purchased from the Sports Centre. Simply enter the number on your OPUS (last 10 digits only) or Olympic Park card when registering your permit. You have linked your permit to your Sports Centre membership, so you will not receive a QR code as you already have a card that gives you access to the parking lot. You must pick up a ticket when you enter the parking lot and pay it when you exit. Be sure to validate your ticket downstairs at the Sports Centre to take advantage of $5 parking (instead of $20). What happens if I leave my vehicle in the parking lot for over 4 hours? You can enter and exit the parking lot at any time with your OPUS card. However, your Monthly Sports Centre permit only covers a period of 4 hours per day. Any time you are parked outside these hours, you will be charged $4/20 minutes to a maximum of $20/day. Are there other parking options I can use besides a 4-hour block of time per day? Yes! You can purchase a “Public” or “OPUS card” parking permit. Simply select from the full list of permits, available here.